The improved Scotts® Turf Builder® Weed & Feed3 features Scotts newest technology in the fight against weeds. WeedGrip™ Technology grips the weeds you see and the ones you don't. This means up to 2X more powerful** dandelion and clover control, in fact it's guaranteed* to clear out dandelions and clover. It does all this while also feeding your lawn to build strong, deep roots to crowd out future weeds. It's Scotts most powerful Weed & Feed ever! 2,500 sq. ft., 5,000 sq. ft., 12,000 sq. ft., and 15,000 sq. ft.
Use on bluegrass, fescue, ryegrass, bermudagrass, zoysia, centipede, and bahiagrass lawns. Some temporary discoloration may occur on bermuda, bahia, centipede, and zoysia lawns. 1) Check the Weather: If rain is in the forecast in the next 24 hours, apply another day. Rain can wash the particles off of weed leaves before it has a chance to work properly. 2) Fill and Set Spreader: Applying Scotts® Turf Builder® Weed & Feed requires a lawn spreader. If you need a new spreader, you can find one here. Refer to the Spreader Settings section above to set your spreader properly. 3) Apply to Wet Lawn: Make sure the grass is wet from dew or sprinkling before applying. This helps particles adhere to weed leaves to produce best results. For even application walk at a steady pace slightly overlapping each pass. After applying this product you don't water your lawn for at least 24 hours. Just like rain, watering your lawn after applying Weed & Feed washes the weed control particles off of weed leaves before they can fully work. 4) Clean-Up: Sweep product from hard surfaces onto the lawn to keep valuable feeding nutrients on the grass and out of storm drains. Do not use on St Augustinegrass (including Floratam), Dichonda, Lippia, Carpetgrass, and Bentgrass lawns as injury may occur. Apply when weeds are actively growing and daytime temperatures are between 60°F and 90°F. In the northern US, weeds are most active April-September. In the southern US, weeds are most active March-September. If you have recently applied another fertilizer (e.g. 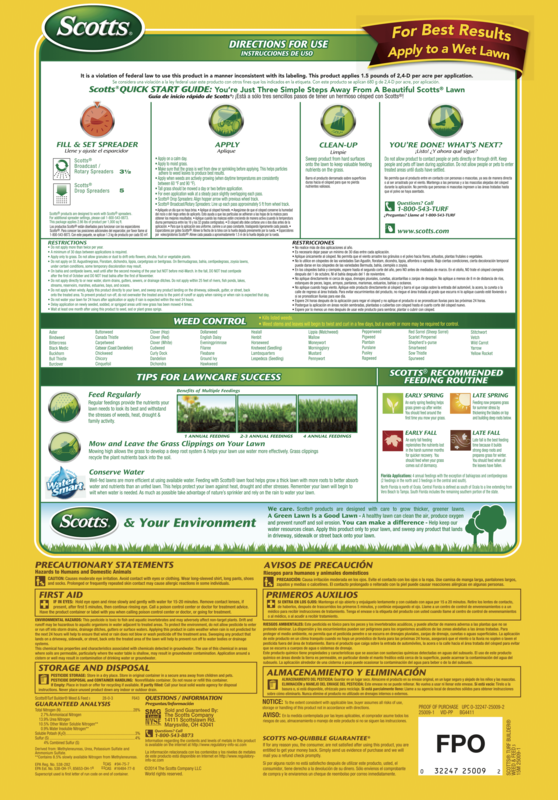 Scotts® Turf Builder® Lawn Food or Scotts® Turf Builder® Halts® Crabgrass Preventer with Lawn Food) wait at least 30 days to apply Scotts® Turf Builder® Weed & Feed. Apply up to two times per year. Wait at least 30 days between applications. Well-fed lawns are more efficient at using available water. Feeding with Scotts® lawn food helps grow a thick lawn with more roots to better absorb water and nutrients than an unfed lawn. This helps protect your lawn against heat, drought and other stresses. Remember your lawn will begin to wilt when water is needed. As much as possible take advantage of nature's sprinkler and rely on the rain to water your lawn. A minimum of 30 days between applications is required. Avoid product contact with people and pets. Delay application on newly seeded, sodded or sprigged areas until new grass has been mowed 4 times. Wait at least one month after application to seed, sod or plant grass springs. This is for grass not flowers, shrubs, fruit and vegetable plants. If accidental contact with other plants is made rinse off immediately to mitigate damage. Don't apply to or near, water, storm drains, gutters, sewers, or drainage ditches. Apply at least 25' from any body of water. Tall grass should be mowed a day or two before application. Do not mow your grass on the day of application and don't mow for 2-3 days after application. Keep people and pets off lawn during application. Do not allow people or pets to enter treated areas until dusts have settled. Particles should stick to weed leaves for at least 24 hours after application, so it is best to limit activity from kids and pets for 24 hours after application. Offers up to 2x more powerful weed control in your lawn (versus prior formulation) to clear out dandelion, clover and other common weeds. *Satisfaction guarantee or your money back. WeedGrip Technology grips the weeds you see and the ones you don’t to make room for strong, green grass to grow. 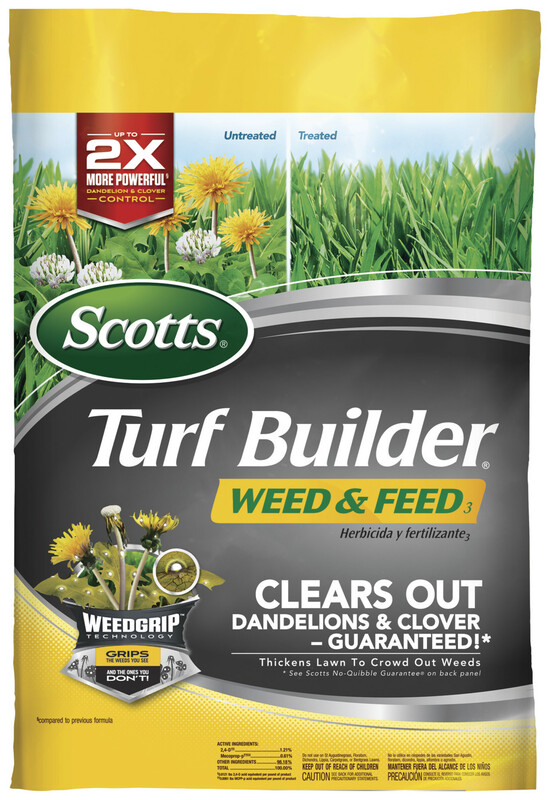 Scotts® Turf Builder® Weed & Feed works double duty as a fertilizer and weed killer. Grow deeper, stronger roots for a thick green lawn all while crowding out future weeds.